Aquitaine ( ; [akitɛn]; Occitan: Aquitània; Basque: Akitania; Poitevin-Saintongeais: Aguiéne), archaic Guyenne/Guienne (Occitan: Guiana) was a traditional region of France, and was an administrative region of France until 1 January 2016. It is now part of the new region Nouvelle-Aquitaine. It is situated in the south-western part of Metropolitan France, along the Atlantic Ocean and the Pyrenees mountain range on the border with Spain. It is composed of the five departments of Dordogne, Lot-et-Garonne, Pyrénées-Atlantiques, Landes and Gironde. In the Middle Ages, Aquitaine was a kingdom and a duchy, whose boundaries fluctuated considerably. There are traces of human settlement by prehistoric peoples, especially in the Périgord, but the earliest attested inhabitants in the south-west were the Aquitani, who were not proper Celtic people, but more akin to the Iberians (see Gallia Aquitania). Although a number of different languages and dialects were in use in the area during ancient times, it is most likely that the prevailing language of Aquitaine during the late pre-historic to Roman period was an early form of the Basque language. This has been demonstrated by various Aquitanian names and words that were recorded by the Romans, and which are currently easily readable as Basque. Whether this Aquitanian language (Proto-Basque) was a remnant of a Vasconic language group that once extended much farther, or whether it was generally limited to the Aquitaine/Basque region is not known. One reason the language of Aquitaine is important is because Basque is the last surviving non-Indo-European language in western Europe and it has had some effect on the languages around it, including Spanish and, to a lesser extent, French. The original Aquitania (named after the inhabitants) at the time of Caesar's conquest of Gaul included the area bounded by the Garonne River, the Pyrenees and the Atlantic Ocean. 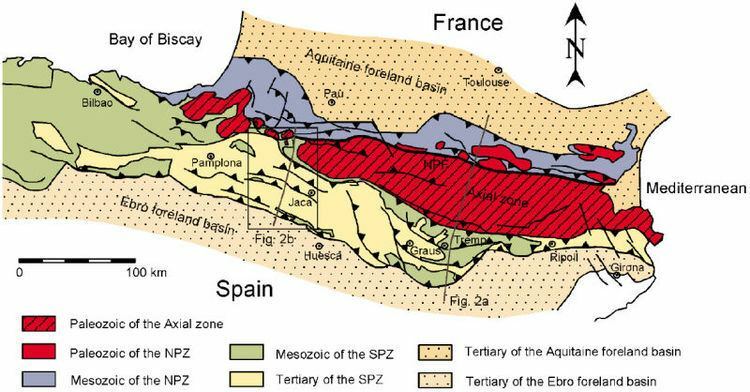 The name may stem from Latin 'aqua', maybe derived from the town "Aquae Augustae", "Aquae Tarbellicae" or just "Aquis" (Dax, Akize in modern Basque) or as a more general geographical feature. Under Augustus' Roman rule, since 27 BC the province of Aquitania was further stretched to the north to the River Loire, thus including proper Gaul tribes along with old Aquitani south of the Garonne (cf. Novempopulania and Gascony) within the same region. In 392, the Roman imperial provinces were restructured and Aquitania Prima, Aquitania Secunda and Aquitania Tertia (or Novempopulania) were established in south-western Gaul. Accounts of Aquitania during the Early Middle Ages are a blur, lacking precision, but there was much unrest. The Visigoths were called into Gaul as foederati, legalizing their status within the Empire. Eventually they established themselves as the de facto rulers in south-west Gaul as central Roman rule collapsed. Visigoths established their capital in Toulouse, but their tenure on Aquitaine was feeble. In 507, they were expelled south to Hispania after their defeat in the Battle of Vouillé by the Franks, who became the new rulers in the area to the south of the Loire. The Roman Aquitania Tertia remained in place as Novempopulania, where a duke was appointed to hold a grip over the Basques (Vascones/Wascones, rendered Gascons in English). These dukes were quite detached from central Frankish overlordship, sometimes governing as independent rulers with strong ties to their kinsmen south of the Pyrenees. As of 660, the foundations for an independent Aquitaine/Vasconia polity were established by the duke Felix of Aquitaine, a magnate (potente(m)) from Toulouse, probably of Gallo-Roman stock. Despite its nominal submission to the Merovingians, the ethnic make-up of new realm Aquitaine wasn't Frankish, but Gallo-Roman north of the Garonne and main towns and Basque, especially south of the Garonne. A united Basque-Aquitanian realm reached its heyday under Odo the Great's rule. In 721, the Aquitanian duke fended Umayyad troops (Sarracens) off at Toulouse, but in 732 (or 733, according to Roger Collins), an Umayyad expedition commanded by Abdul Rahman Al Ghafiqi defeated Odo next to Bordeaux, and went on to loot its way up to Poitiers. Odo was required to pledge allegiance to the Frankish Charles Martel in exchange for help against the advancing Arabic forces. Basque-Aquitanian self-rule temporarily came to a halt, definitely in 768 after the assassination of Waifer. In 781, Charlemagne decided to proclaim his son Louis King of Aquitaine within the Carolingian Empire, ruling over a realm comprising the Duchy of Aquitaine and the Duchy of Vasconia He suppressed various Basque (Gascon) uprisings, even venturing into the lands of Pamplona past the Pyrenees after ravaging Gascony, with a view to imposing his authority also in the Vasconia to south of Pyrenees. According to his biography, he achieved everything he wanted and after staying overnight in Pamplona, on his way back his army was attacked in Roncevaux in 812, but narrowly escaped an engagement at the Pyrenean passes. Seguin (Sihiminus), count of Bordeaux and Duke of Vasconia, seemed to have attempted a detachment from the Frankish central authority on Charlemagne's death. The new emperor Louis the Pious reacted by removing him from his capacity, which stirred the Basques into rebellion. The king in turn sent his troops to the territory, obtaining their submission in two campaigns and killing the duke, while his family crossed the Pyrenees and continued to foment risings against Frankish power. In 824, the 2nd Battle of Roncevaux took place, in which counts Aeblus and Aznar, Frankish vassals from the Duchy of Vasconia sent by the new King of Aquitaine, Pepin, were captured by the joint forces of Iñigo Arista and the Banu Qasi. Before Pepin's death, emperor Louis had appointed a new king in 832, his son Charles the Bald, while the Aquitanian lords elected Pepin II as king. This struggle for control of the kingdom led to a constant period of war between Charles, loyal to his father and the Carolingian power, and Pepin II, who relied more on the support of Basque and Aquitanian lords. Despite the early conquest of southern Gaul by the Franks after the Battle of Vouillé in 507, the Frankish element was feeble south of the Loire, where Gothic and Gallo-Roman Law prevailed and a small Frankish settlement took place. However scarce, some Frankish population and nobles settled down in regions like Albigeois, Carcassone (on the fringes of Septimania), Toulouse, and Provence and Lower Rhone (the last two not in Aquitaine). After the death of the king Dagobert I, the Merovingian tenure south of the Loire became largely nominal, with the actual power being in the hands of autonomous regional leaders and counts. The Franks may have become largely assimilated to the preponderant Gallo-Roman culture by the 8th century, but their names were well in use by the ruling class, like Odo. Still, in the Battle of Toulouse (721), the Aquitanian duke Odo is said to be leading an army of Aquitanians and Franks. On the other hand, the Franks didn't mix with the Basques, keeping separate paths. In the periods before and after the Muslim thrust, the Basques are often cited in several accounts stirring against Frankish attempts to subdue Aquitaine (stretching up to Toulouse) and Vasconia, pointing to a not preponderant but clearly significant Basque presence in the former too. Recorded evidence points to their deployment across Aquitaine in a military capacity as a mainstay of the Duke's forces. 'Romans' are cited as living in the cities of Aquitaine, as opposed to the Franks (mid 8th century). After the 843 Treaty of Verdun, the defeat of Pepin II and the death of Charles the Bald, the Kingdom of Aquitaine (subsumed in West Francia) ceased to have any relevance and the title of King of Aquitaine took on a nominal value. In 1058, the Duchy of Vasconia (Gascony) and Aquitaine merged under the rule of William VIII, Duke of Aquitaine. The title "Duke of Aquitaine" was held by the counts of Poitiers from the 10th to the 12th century. Aquitaine passed to France in 1137 when the duchess Eleanor of Aquitaine married Louis VII of France, but their marriage was annulled in 1152. When Eleanor's new husband became King Henry II of England in 1154, the area became an English possession, and the cornerstone of the so-called Angevin Empire. Aquitaine remained English until the end of the Hundred Years' War in 1453, when it was annexed by France. During the three hundred years that the region was ruled by the Kings of England, links between Aquitaine and England strengthened, with large quantities of wine produced in southwestern France being exported to London, Southampton, and other English ports. In fact, so much wine and other produce was being exported to London and sold that by the start of the Hundred Years' War the profits from Aquitaine was the principal source of the English King's income per annum. The region served as a stronghold for the Protestant Huguenots during the sixteenth and seventeenth centuries, who suffered persecution at the hands of the French Catholics. The Huguenots called upon the English crown for assistance against Cardinal Richelieu. From the 13th century until the French Revolution, Aquitaine was usually known as Guyenne. Aquitaine consists of 3,150,890 inhabitants, equivalent to 6% of the total French population. The region of Aquitaine forms the 6th most populated region in France. French is the official language of the region. Many residents also have some knowledge of Basque, of a variety of Occitan (Gascon, Limousin, or Languedocien), or of the Poitevin-Saintongeais dialect of French. In 2005, 78,000 children were learning Occitan as a second language in state schools and 2,000 were enrolled in Occitan-medium private schools. Bordeaux is the largest city in Aquitaine. It is a port city on the Garonne River in the Gironde department. It is the capital of Aquitaine, as well as the prefecture of the Gironde department. Bordeaux is famous for its wine industry. Apart from Bordeaux, there are also other important cities in Aquitaine. FC Girondins de Bordeaux, one of France's most successful association football teams. Biarritz Olympique, runners-up in the 2005-6 Heineken Cup. Bull-fighting is also popular in the region. Major Surfing championships regularly take place on Aquitaine's coast.